Fresh Food Café is Roadchef's current self-branded café, serving fresh takeaway food, salads, coffee and the most popular full meals. Unlike most motorway restaurants created until then, all food is cooked behind a single ordering point, which minimises the footprint taken up by the restaurant and avoids the problem many services have found, where one of the largest facilities receives little use. In 2008, Roadchef registered the name Simply Put. It's thought this was just a proposal. Roadchef introduced their new restaurant idea as part of a trial of a large shake-up of catering options at Strensham, under the name Hot Food Company, using a distinctive orange theme. After two years, the trial was declared a success, and more restaurants started to take that name: these were branded Hot Food Co. and used a red-on-white theme. In October 2012, Clacket Lane and Norton Canes gained a stand from The Bread Kitchen, which was removed in late 2013. Lavazza was briefly trialled at Watford Gap southbound. 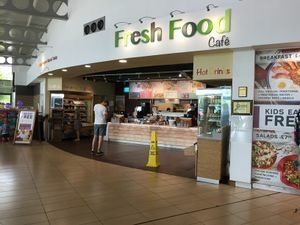 In 2012, as Roadchef continued their experiments with catering to see how to get the best result from customers, Fresh Food Café was introduced to Watford Gap. It uses a green colour scheme, and is slightly more slimmed down than it's predecessor, usually accompanying a full rebuild of the entire dining area. One novel feature is the menu written out across the wall. Since 2014, more services have been refurbished and are now providing Fresh Food Café. Despite the investment, it should be noted that as trade is no longer as high as it would have been 20 years ago, the opening hours are shorter: the main target is the breakfast market. Smaller services do not have the restaurant. In summer 2018, Roadchef introduced a new concept to Fresh Food Café where the café shares a space with Chozen Noodle and operates as 'The Breakfast Kitchen' during the morning and Chozen Noodle during the afternoon.